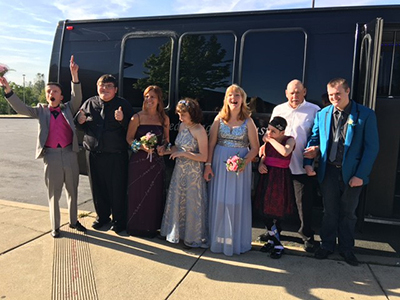 Union Mine High School students from Shelley Abel-Smith’s Special Education Transition class were invited to join students from Jared Parker’s class at El Dorado High School for a prom and dinner, hosted by the EDHS leadership class on April 21. The students were driven to the event in a limousine donated by Preferred Image Limousine. Dinner was served in an elegant setting at The Foothill Grill, complete with fresh flowers and white tablecloths. Next, the young men and women were escorted on a path of rose petals to the dance. Every guest was formally announced as they entered the spectacularly decorated venue. Young adults from both the EDHS leadership class and the UMHS Friends and Foundations group danced and socialized with all the guests. Everyone had a fabulous time, and great memories were made!